Give a whole new dimension to your X-Wing parties! On the volcanic planet Mechis III, the terrifying IG-88 assassin droids altered an Agressor assault fighter, adding weapons, a prison hold, sophisticated computers and a KDY Galaxy-15 ionic engine. . Fast, agile and particularly deadly, the IG-2000 and the devices in its series were among the most feared hunters in the galaxy. 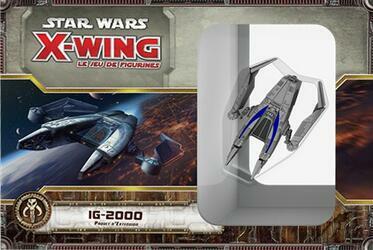 This Expansion Pack includes everything you need to add 1 IG-2000 (Agressor) to your games.